There are 63 minerals sized at Small Cabinet. 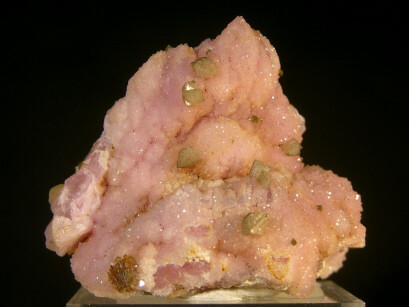 Super bypiramidal tan crystals of wardite to 9 MM associated with a fan of esophorite crystals and 2 MM groups of zanazziite crystals ( a very rare calcium iron magnesium berylium phosphate), all on a matrix of large deep rose quartz crystals that are sprinkled by a secondary druse of quartz. A spectacular old timer from Taquaral. 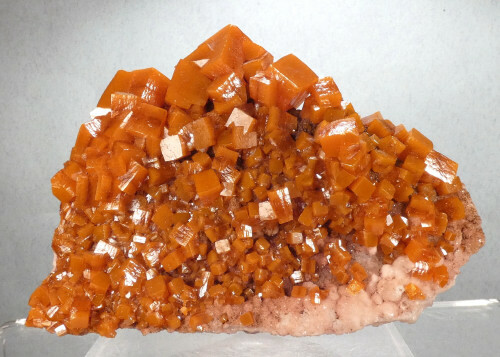 Lustrous, butterscotch blocky crystals of wulfenite on a matrix of white calcite. Superb color on this one. 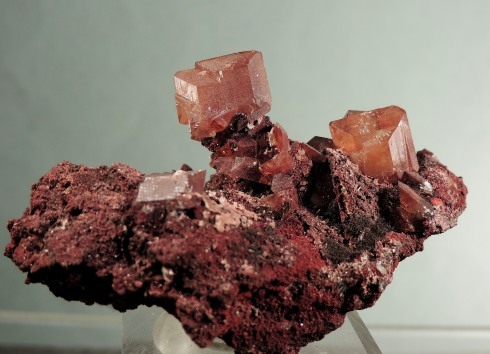 Amber colored, translucent and lustrous platy crystals of wulfenite aesthetically poised at the tip of a rusty colored calcite matrix. Some of the crystals have micro chipping that is visible with magnification, but they are very sharp none the less. Largest crystal is 1.5 cm across. Very attractive specimen.